Giovanni (Alberto Sordi from The Best of Enemies) lives far beyond his means to provide for his wife's worldly needs (Gianna Maria Canale from I Vampiri). Nearly insolvent and terribly worried at the idea of losing his wife, he thinks of committing suicide when an ad gives him hope again: a rich man is offering a life changing amount of money to anyone able to give him one of his eyes. 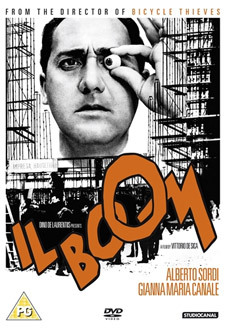 Il Boom is a hilarious, one of a kind, bittersweet Italian comedy from groundbreaking director Vittorio De Sica (he of Shoeshine, Bicycle Thieves and Umberto D, like you need to be told that), set during the Italian economic miracle which transformed the country in the span of a decade, from the late 50s to the onset of the 70s. To mark it's 50th Anniversary, Il Boom will make its UK DVD premiere, courtesy of Studiocanal on 23rd April 2012 at the RRP of £15.99. Somewhat surprisingly for a 50th Anniversary Edition, there are no extra features. The film will also screen at this year's Italian Film Festival in Scotland at the GFT on the 18th April and the Edinburgh Filmhouse on 24th April.